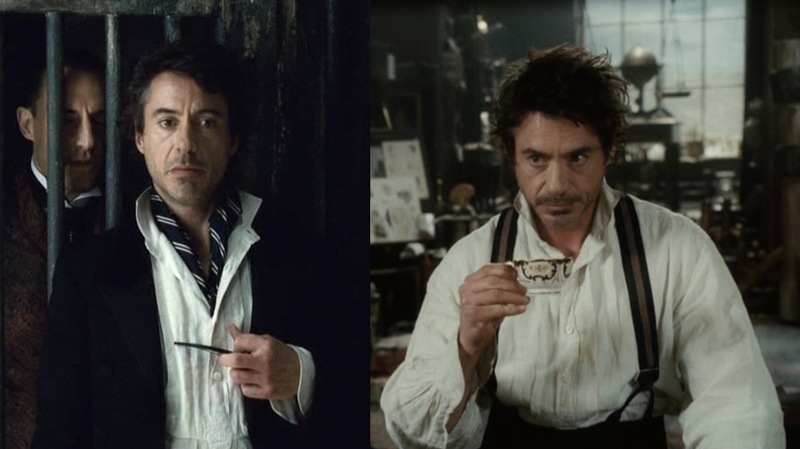 Robert Downey, Jr. as Sherlock Holmes in Sherlock Holmes (2009). Announcement of the 2009 update of Arthur Conan Doyle’s legendary detective, Sherlock Holmes, met with some initial criticism. Many believed that the action-oriented director Guy Ritchie would dumb down the flawed but efficient genius of Doyle’s stories and instead focus on action and box office draws. 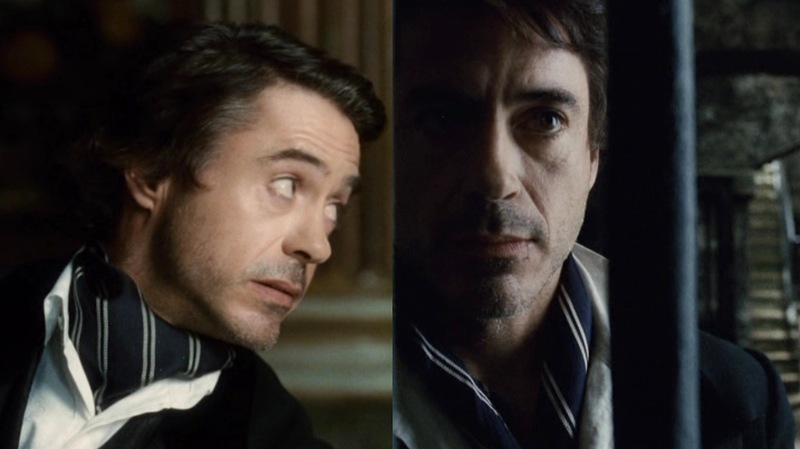 However, the smartly-paced story, the excellent performances (notable Downey, Jr. as Holmes), and the era-evoking visuals surprised many and the film received mostly positive reviews and critical attention, with a sequel, Sherlock Holmes: A Game of Shadows, released two years later. Watson: You’ve been in this room for two weeks, I insist you have to get out. Holmes: There is absolutely nothing of interest to me… out there… on Earth… at all. Watson: So you’re free this evening? After setting the evening’s dinner for 8:30 at the Royale, Watson tells Holmes to “wear a jacket.” Holmes immediately demands the same of Watson, but indeed Sherlock shows up to dinner looking much neater than he had previously. The “jacket” that Holmes chooses is a black wool frock coat. Holmes’ is double-breasted in a style also known as a “Prince Albert” coat. There are peak lapels, as there should be with a double-breasted front, with velvet collars and satin half-facings. Three horizontal buttonholes are on the self-faced edge of each lapel. All of the frock coat’s buttons are satin-covered, including the six on the front, the two on each cuff, and the two decorative buttons on the rear above the five back seams. The 2-button cuffs were standard of the era, but many frock coats also featured turnback cuffs. Holmes’ coat has strongly roped sleeveheads with minimal drape and a tightly suppressed waist. This is indicative of the era’s coats, all of which were bespoke, rather than the looser “ready-made” frock coats available today. Holmes’ frock coat, like many of the era, has no outer pockets. There are certainly no hip pockets, and the breast pocket wasn’t popular on suit coats until much later in the era. Holmes is not a slob; he merely makes his own rules… Watson just wants to make sure he does not turn up for the meal in his pyjamas. He need not have worried. Holmes sits alone in the posh London dining hall, smartly, if a little chaotically attired in black double breasted frock coat with velvet lapels, white soft collar shirt, patterned silk waistcoat (“I never worked out whether he had ‘borrowed’ it from Watson. They kept adding in lines so I never really knew quite what was going on” attests [costume designer Jenny Beavan]), and blue and white striped herringbone silk scarf. Perhaps Holmes should be wearing a tail-coat rather than frock for the evening, though he has clearly made some effort for Watson. 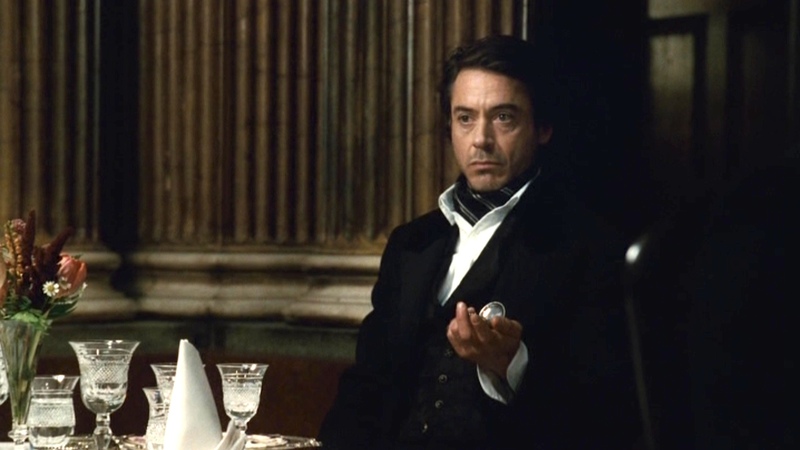 A fancy waistcoat, like Watson’s black silk patterned vest worn by Holmes in this scene, was appropriate especially for a dinner like this. Waistcoats worn with frock coats were typically double-breasted, but Holmes isn’t the type to follow convention. Here, the vest is single-breasted with five “knotted brass” buttons. An adjustable strap across the black silk-lined rear keeps the “hourglass” silhouette offered by the frock coat. 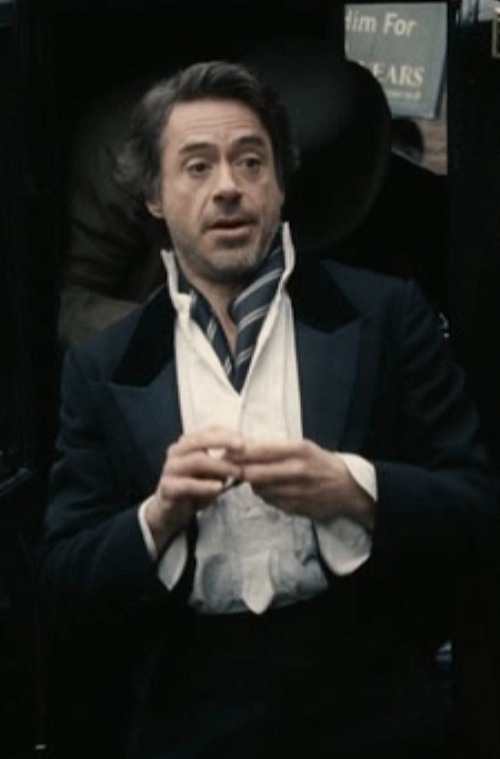 Holmes wears his silver pocketwatch in the vest’s left pocket. 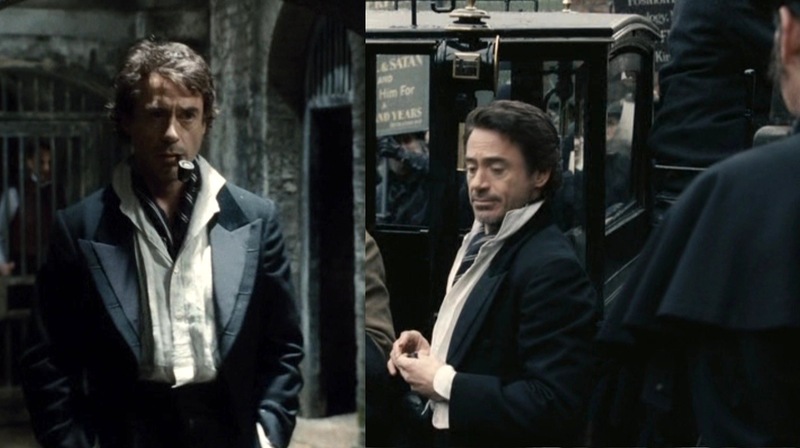 Unfortunately for Holmes, he loses the waistcoat when Watson tosses it from a carriage the next day. Evidently, he had saved his watch from this ignominious fate. 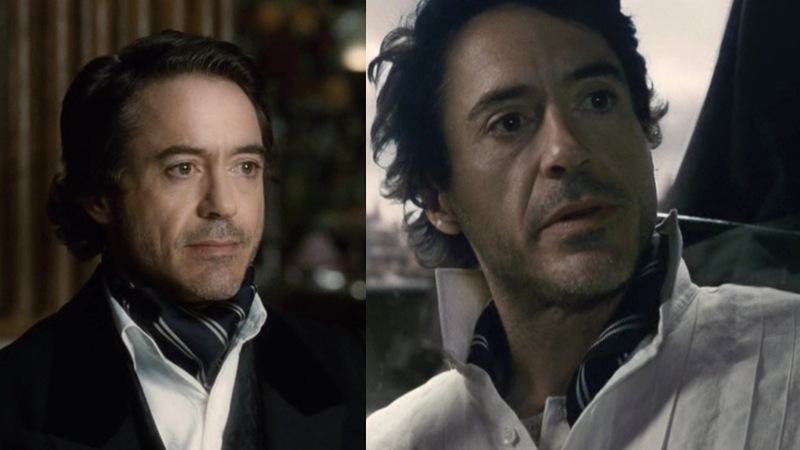 In further disobedience of convention, Holmes ignores the standard stiff white detachable collar with single cuffs. Instead, he wears a white pullover shirt with soft turndown collars, barrel cuffs (which he leaves unbuttoned), and a broadly-pleated front bib with four white buttons down the placket to a “tongue” tab at the bottom. The shirt has a very voluminous fit, especially noted by the puffy sleeves. Holmes is disdainful of the dinner, so he wears the collars turned down – as seen on the standard dress shirt today. However, when visiting Lord Blackwood the next day, he has his collars turned up to resemble a standing collar. While still definitely less formal, it reflects his appreciation of the prison visit as a more somber event than the failed dinner with Mary. Underneath the shirt, Holmes wears a large dark blue striped herringbone silk scarf, tied like an ascot. Typically, men wore their cravats over the shirt, fastened in place with a pearl. However, this is Holmes we are dealing with. The scarf has white double Harvard stripes separated by a dark burgundy stripe, all running down from the right shoulder to the left hip. Interestingly, this stripe direction is often associated with American neckties. 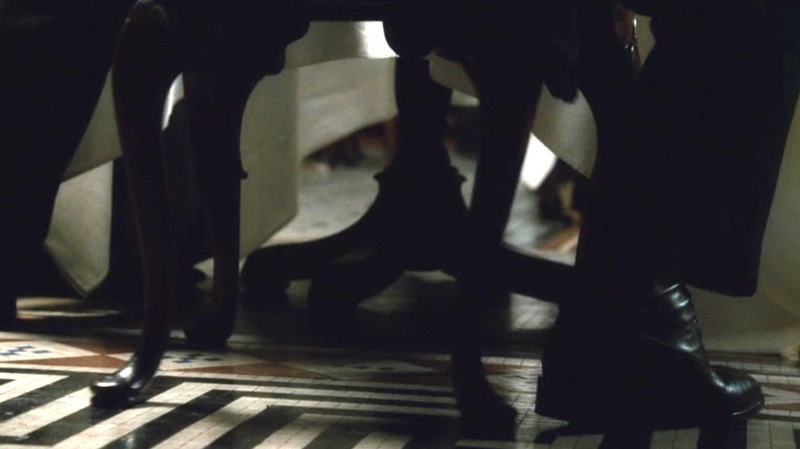 Holmes’ black trousers are perhaps the only item here that would be traditionally seen with a frock coat. As they should be, the trousers are plain-hemmed with a high waist and a frogmouth rear for suspenders/braces. The suspenders are a must to keep the shirt from showing underneath the waistcoat. Holmes’ trousers are slightly baggier with a relaxed fit, and he has angled side pockets. …He wears relaxed high-waisted black trousers, a style briefly popular in the late 1800s. His big belt is perhaps a historical indulgence, yet may have been worn by blue-collar workers. One would imagine this is how Holmes sees himself, as not belonging to either class but rather an anarchic mixture of both. The actual suspenders, which he removes when he participates in the shirtless bare-knuckled brawl, are block-striped in black and brown, with the two black outer stripes surrounding the center brown stripe. It has silver clips on the front, brass adjusters on the rear, and dark brown leather hooks that button inside the front and to the rear frogmouth opening of Holmes’ trousers. The proper footwear for the occasion would have been patent leather button boots with a cap toe. 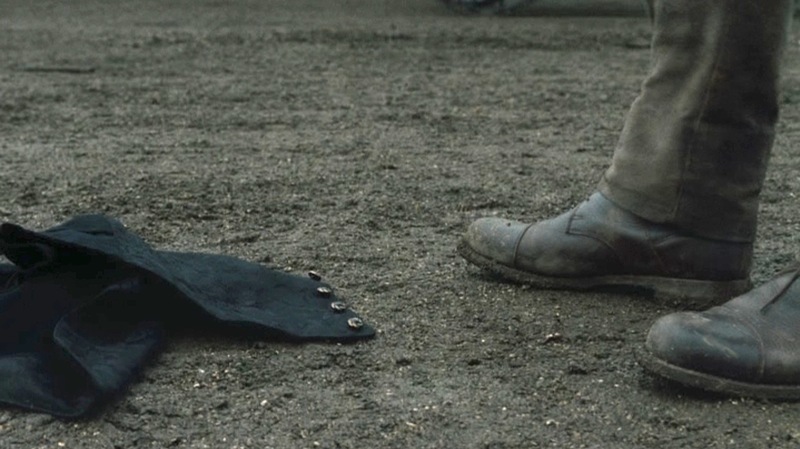 We don’t see much of Holmes’ boots, but I can deduce that they are a black leather with buttons down the side and a squared plain-toe front, worn with black socks. 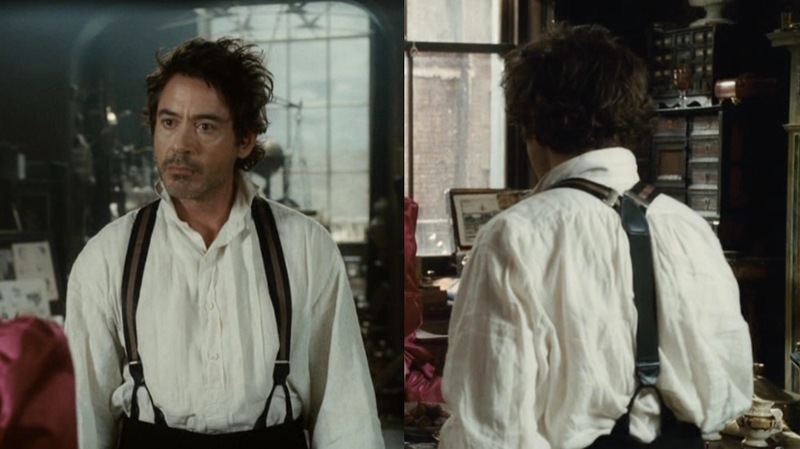 Holmes’ undershirt is the same throughout the film, an off-white short-sleeved henley with three white buttons. 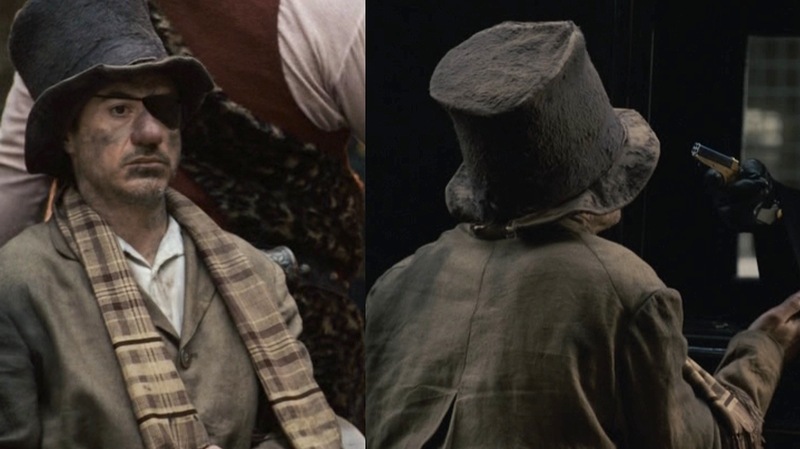 After waking up to find Irene Adler in his flat, Holmes takes off after her in a makeshift “tramp” disguise, adding an old stovepipe hat, a light brown plaid wool scarf, and a black eyepatch. He borrows Watson’s light brown raincoat, which looks much less immaculate after a trip out the window into the grime of the London streets. He finishes his ensemble with a gold striped silk scarf, tied around his coat waist like a sash. This is not a look to strive for. Holmes’ Bohemian take on a frock coat for dinner would have been just as out of place 124 years ago as it is now, but that’s not something he would have concerned himself with; if he liked the look and feel of something, he wore it. This is a maxim many men should carefully adopt. So why am I posting about Holmes today? Holmes scholars – notably Christopher Morley – have deduced Holmes’ birthday to be January 6, 1854. If the great detective were still alive today (if he had ever been alive) – he would be turning 160! Have you ever deciphered the initials on Holmes’s undershirt? It looks like a roughly embroidered monogram – not the work of any expert servant. I guess I will have to watch the movie again closely to see…(oh, the things I have to do for research!). In photos, it looks like the letter “R” or “A” with maybe a second letter disappearing under his suspender strap. Why “R” or “A,” I wonder? (It would have been cute if the initials had been “JW” — Holmes borrowing Watson’s shirts. But it’s not…) R for “Ritchie,” maybe?